Heat sinks are components designed to cool off devices by dissipating heat. They can be used passively or in active cooling systems combined with fans for example. When optimizing heat sink designs, you can turn to simulation for guidance. But what if you could simplify the design process by embedding your model in an app? You can — and the Heat Sink with Fins demo app is here to get you started. Suppose that you work at a heat sink manufacturing company. For a fast estimation of the cooling performance of the heat sink, you may use well-known correlations based on geometry and flow properties. However, these correlations are only available for simple geometrical configurations such as flat surfaces, cylinders, or spheres. You can always use such a correlation to approach thermal characteristics of a real-life geometry, but this is not very accurate. For more precise results, you can use simulation. As a simulation expert, you are called upon to test out various heat sink designs. With each design change, you run a new simulation and compare results, which may slow down the manufacturing process. Instead, you could turn to the Application Builder, a groundbreaking way for you to turn your models into apps and enable others to run and re-run your simulations to reflect simple parameter tweaks. 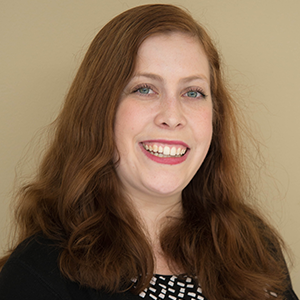 Building an app allows you to construct a scientifically accurate simulation environment that colleagues without simulation backgrounds can use when testing out different design iterations. You can decide exactly what inputs the users of the simulation app can enter, as well as what results they will receive. The demo app we will show you here also contains a feature that emails a simulation report to the app user once the results are in. More on that in a second. The COMSOL Multiphysics simulation software allows you to be creative with many aspects of your application. You can choose how your app will look by changing everything from background images to the entire layout. To walk you through some neat app features that you can implement yourself, we’ll have a look at the Heat Sink with Fins demo app. When it comes to heat sink design, the most important consideration is how well the heat sink can dissipate heat for a given configuration, including flow properties, geometric layout, and more. 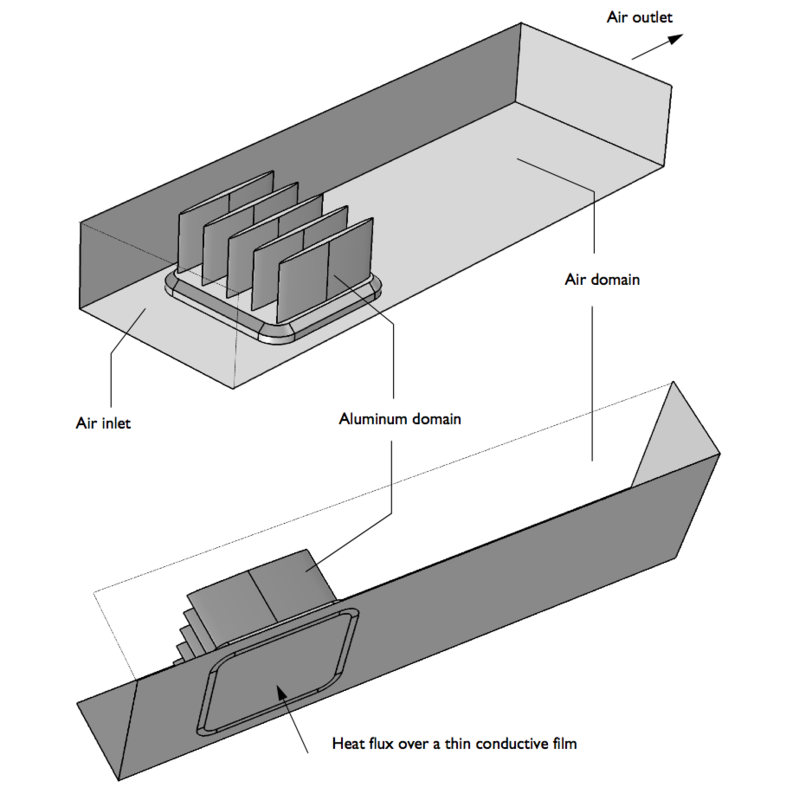 One benchmark to test this involves putting the heat sink inside a rectangular channel with insulated walls. Then, both the temperature and pressure at the inlet and outlet of the channel are measured. The amount of power that is required in order for the heat sink base to maintain a particular temperature is also measured. Ultimately, the results of the benchmark tell you how much heat the heat sink dissipates, as well as the amount of pressure loss over the channel. The heat sink demo app uses simulation to analyze benchmark experiments of heat sinks in a user interface (UI) that is easier to use than traditional simulation environments. With a simplified UI, app users can observe how design elements impact the functionality of the heat sink. For example, when they add a few more fins to the design, they may see that the amount of dissipated heat increases. But when they add too many fins, the results will show that the fins obstruct the flow in the channel and cause a large pressure loss without significantly improving the cooling power — not a good heat sink design, in other words. App users can utilize the knowledge they gain from making these small changes to find out how many fins they should include to meet their design criteria. The geometry of the underlying heat sink model used in the demo app. The equations and boundary conditions necessary to solve the model will run in the background of the simulation app. The app user can update the simulation by changing the parameters without ever having to consider the underlying equations. That way, they do not need to be experts in setting up and running simulations. We have programmed the demo app to update the geometry based on user inputs and show a new version of the model to reflect the new design. The temperature and velocity fields are visualized in the graphics window to the right and the dissipated power and pressure loss results are displayed numerically in a section titled Results on the left-hand side of the app. The app user can also choose to download the results as a simulation report or have the app email the report automatically when the results are ready. A screenshot showing the Heat Sink with Fins demo app. A simple change in inputs allows app users to visualize how a change in the number of fins affects dissipated power and pressure loss. 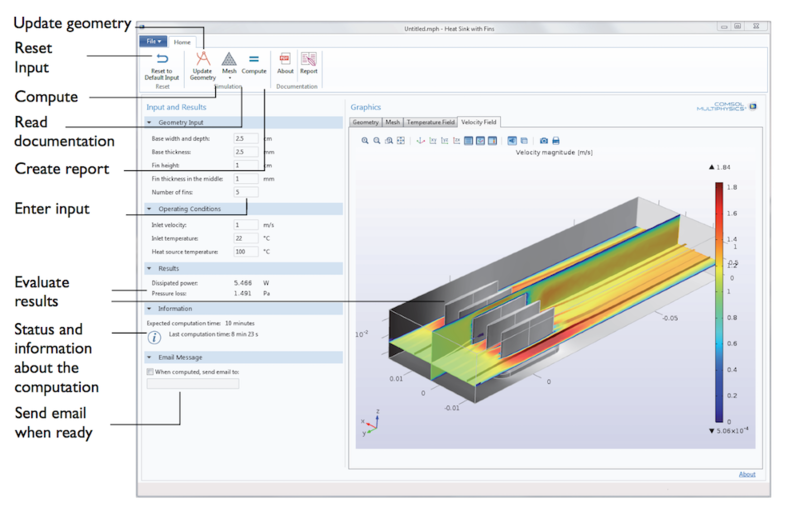 Even without a simulation background, users of the app can leverage the results to create the ideal heat sink design. 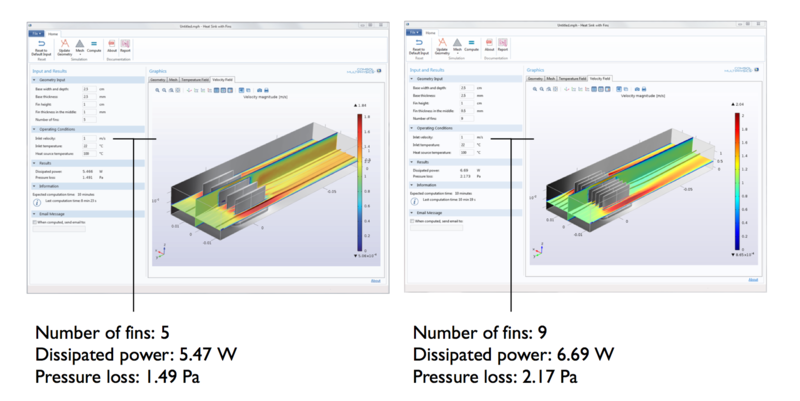 How the number of fins affects dissipated power and pressure loss. Here, a higher number of fins increased the cooling power of the heat sink. The heat sink designer would be quite happy to see that the heat sink has sufficient cooling power. However, this increase in fins also increased the pressure loss. To find the optimal design, app users can easily test multiple heat sink configurations. Everything about the UI of our demo app was created for ease-of-use. If you want to go behind the scenes and see how we set up the app, I encourage you to open the heat sink app file. Thanks to the Application Builder, the possibilities are endless when making your own app. Use this demo app as a stepping stone to creating apps that suit the needs of you and your company. After creating your ideal app, you can make it available to your colleagues (or customers, faculty, and students) via COMSOL Server™.